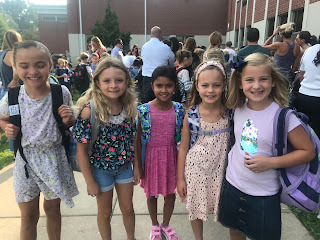 It's been a long wait, but the first day of school finally arrived! Austen's been busy walking his schedule and figuring out how to open his lock expeditiously. (I think he has it down!) Peyton was so excited to get the only male teacher in her whole elementary school (and very happy that she doesn't have a teacher that Austen had like her previous two years). Hailey is just happy to go back to school to see her friends (most of them boys). 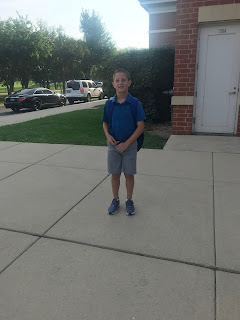 We walked Austen close to school (and surprisingly he wanted us to) to send him off on his own into those middle school years. But he was ready. 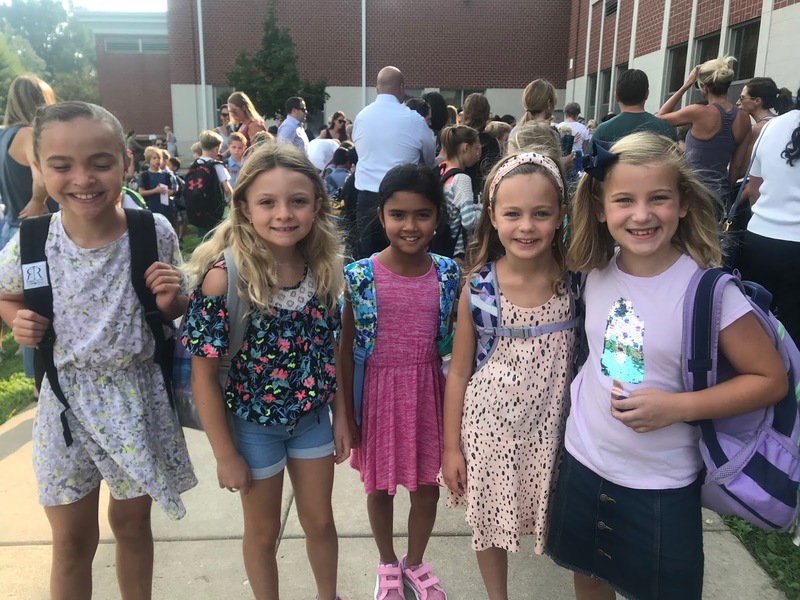 Ready to make new friends, ready to move from class to class and ready to be more independent. 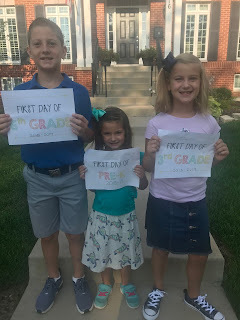 Hailey was excited to be part of the first day pics with her siblings as usually she starts later but today they all started together. Hailey's start time for school also changed which put her going to school right in the middle of when Austen and Peyton leave which will be challenging to figure out since her school is a bit farther from our house (a good 6 minutes or so by car and across the tracks). So Tom may be taking her to school from now on while I usher off the other two. We'll figure it out and get into a routine. Routine - that's one thing that I'm glad to get back into. I do like having a plan every day and some structure to the day. 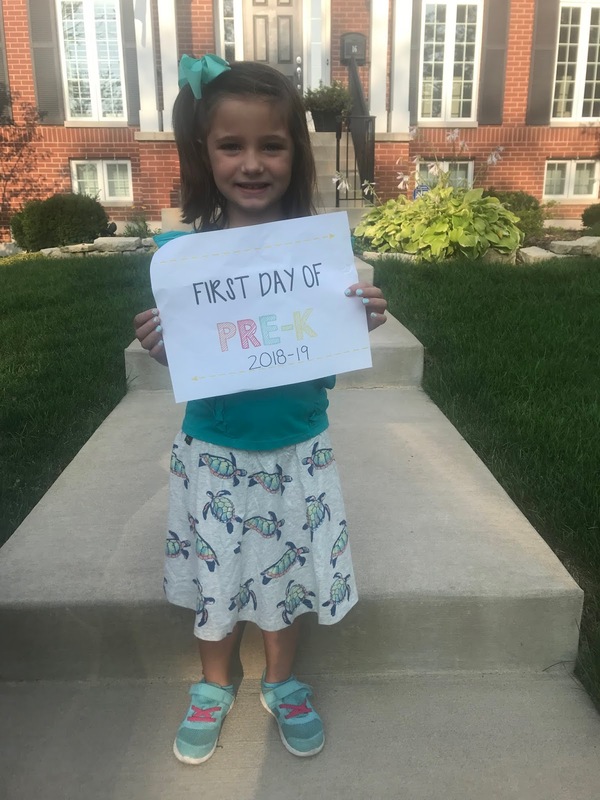 Here's to the 2018-19 school year! 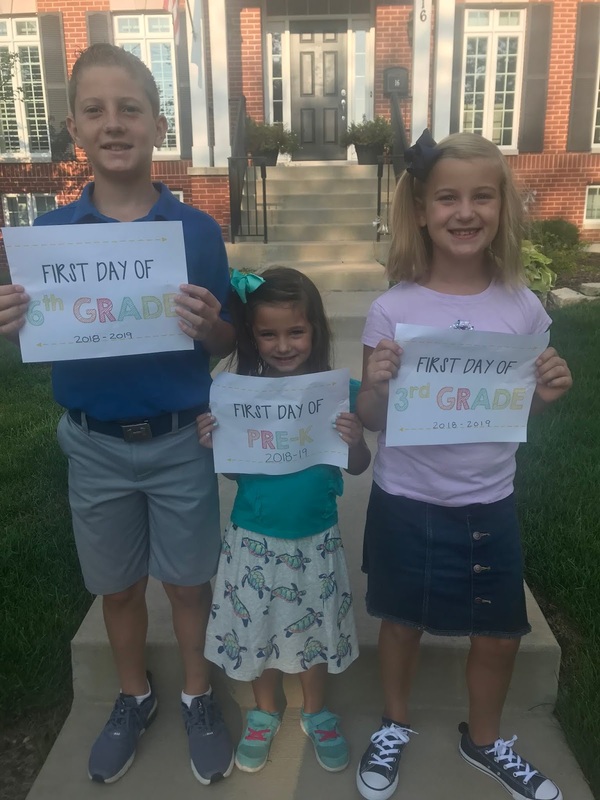 Hope it's a great one for all three of my kiddos! I haven't written in awhile about Sadie so I thought she deserved some face time. She continues to be a happy dog and she's settled in nicely to her 2.5 years. She loves to go for R-I-D-E-S (we have to spell it because to say it gets her too excited unless you're ready at that moment to take her with you!) in the car and travels really well but we've yet to bring her on a big road trip with us because she's much too big and takes up a lot of space! How did Adler get to go on so many trips, I wondered, but we can't fit Sadie? Well, first, I guess she's a lot bigger! About 30 pounds bigger than Adler. Second, we didn't have 3 kids most of Adler's life when we traveled so there was a little bit more space for her. And, third, Adler didn't chew my seat belts in the back of my car so I didn't have to replace them regularly much to my dismay! But, while we are away, we are always thinking of her and bring her back treats that the kids picked out for her like a dolphin cookie or a peanut butter doughnut from the dog bakery. She had such fun eating them both and the kids were so excited to give them to her. At 2.5 years, she finally decided (with a nudge from us) to stop sleeping in her crate at night in our bedroom (so glad I don't have that huge thing in my room anymore!). We rolled out Adler's old pillow and she's adjusted nicely to sleeping on that and then moving to the cold bathroom floor when she's hot. In the morning, like Adler, she usually waits for us to wake up even though Hailey will try to get her to go downstairs with her. Sometimes she'll rest her head on the side of the bed inches from my face and then I'll feel this tongue lick my eye or some part of my face. What a sweet way to wake up! She's growing up our Sadie. Her foot dragging hasn't gotten much better so it's still short walks for her. But she sees a chiropractor for some cold laser therapy every month or so and her condition hasn't gotten worse. She can still run and play with us (just not with other dogs where she'll overdo it) and she's happy. That's all we can ask for as I think this dog is going to live a long life with all of her surgeries and therapies she put us through in her first 2 years. At least I can only hope! This doughnut looks sooo good! 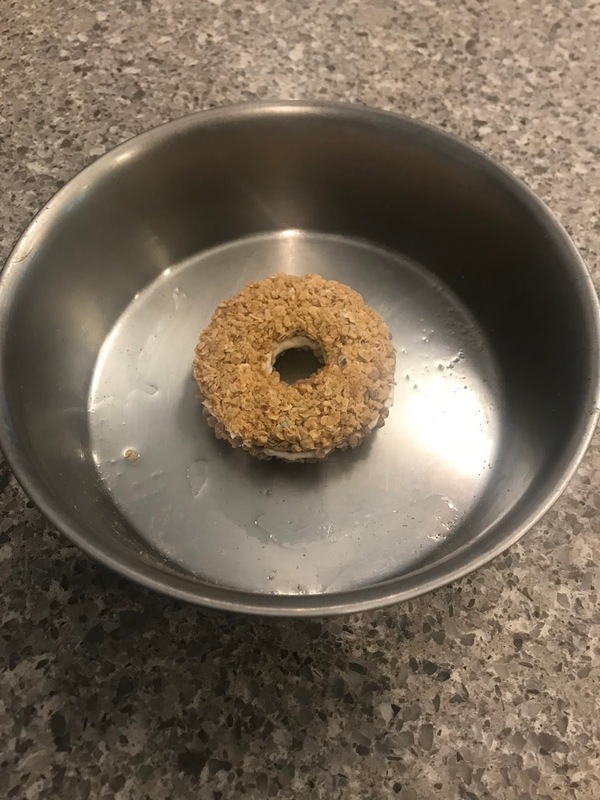 And it's a doggie doughnut! A few weeks before the end of swim team, Peyton got in the car after practice in tears. My friend got swimmer of the week, she said, and I did not. They said she always comes to practices and meets and she doesn't but I do. "Why didn't I get swimmer of the week?" she whined. This was a teachable moment so I told her that she should be happy for her friend getting swimmer of the week. 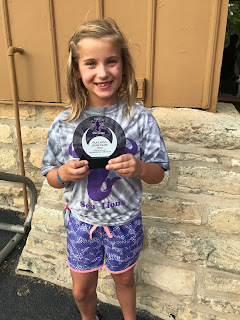 However, I understood her disappointment as she really had been working hard at swimming - attending every single practice and meet when she didn't have to and doing pretty well overall for her first year of swimming. Keep working hard, I told her, your hard work will pay off (this is my mantra I use with Austen a lot too - If you put in the work, you'll see good results). 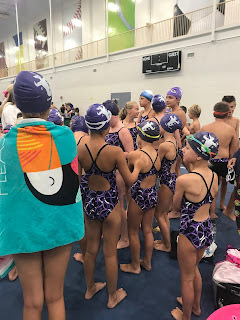 So she kept her head down, kept going to swim practices and all the meets (until she had to leave for sleep away camp for a week), but the day she got home she wanted to go to the pool to practice as the next day was her conference meet and she hadn't been swimming laps since she'd been away all week. Even though it was rather cool and started to rain, she went to make sure she was at least a little ready the next morning for her meet. The conference meet was a lot like I remember going to my brother's meets. Inside, long and somewhat boring. 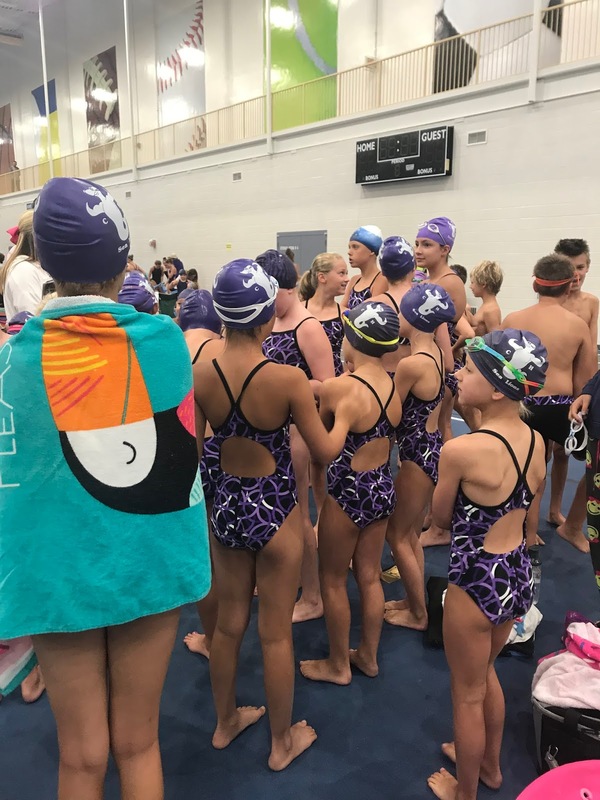 She swam in 2 events and did okay as she was swimming against some kids that probably swim all season long. Still she placed 4th in backstroke out of 2 heats which wasn't bad at all and her relay team did okay too but placed pretty high. The conference meet marked the end of the season before the awards banquet. We had a conflict the night of the swim banquet as Austen had lacrosse followed by baseball tryouts so one of us had to go with him and the other with Peyton. She wanted me to come so I went with her and I could already sense how disappointed she was going to be if she didn't win an award. 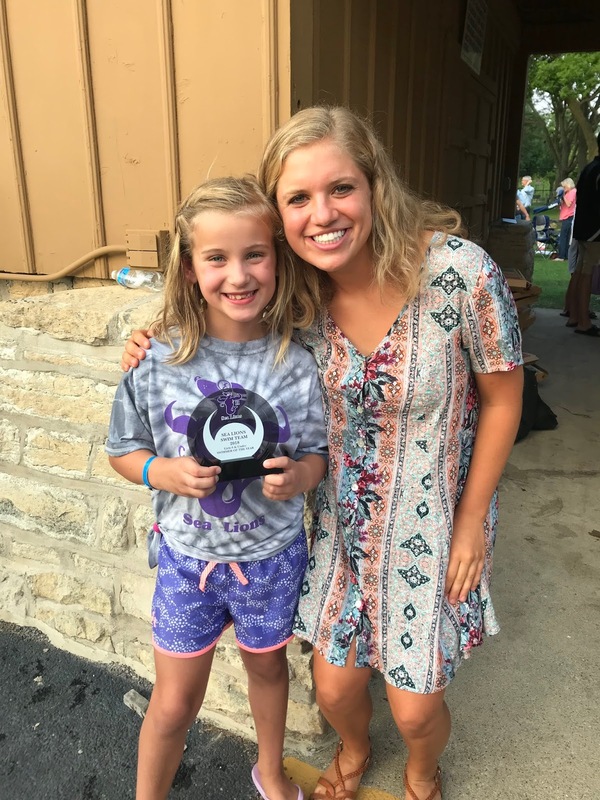 I mean this is my kid who doesn't like to work too hard really at anything but she did put forth a lot of effort at swimming this summer and even though I was so proud of her, that was not enough for her. 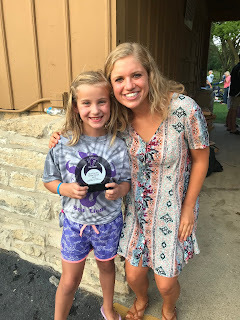 They give awards (using superlatives) to all the kids first and she got the award for being a speedy swimmer. After they went through almost 100 swimmers, they announced the 8U girls swimmer of the summer/year....Peyton Szurgot! She was so happy - grinning from ear to ear and skipping over to me with her award. See, this is probably why she was never swimmer of the week - they don't win swimmer of the year. Everything happens for a reason, I told her. 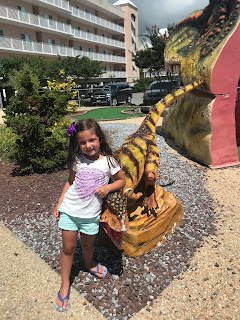 We just returned from our 2018 summer vacation in Rehobeth Beach, Delaware. 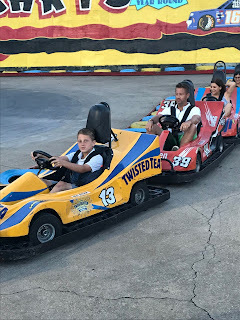 It was a kid's paradise - beach, carnival rides and games, arcade mini golf, go karts and ice cream - repeat! What could be better when you're a kid?! In fact, my favorite vacations when I was a kid involved those too. Not quite a relaxing and peaceful mecca for the parents but hey this isn't always all about us. If we hadn't had them then we'd be in Bora Bora or the Maldives or Fiji right now, I'm quite sure. Anyway, those will have to wait til after they are grown and gone. Back to Rehobeth. We rented a cute little beach house right in town that was 1.5 blocks to the beach and very close to everything else in Rehobeth including some cute restaurants which we walked to most nights. The first day we did the beach - great waves for boogie boarding and just plain fun. The second day it rained so we explored the coast of Delaware and Maryland and their beach towns. That night we saw Mary Poppins at the local community playhouse which was great fun for all (including Papa who came to join us on part of our vacation - thanks Papa!). 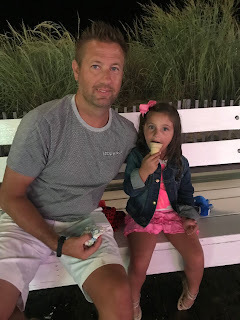 The next day proved to be another great beach day and by Wednesday we were ready to do more exploring as we took the ferry from Lewes, Delaware to the tip of Cape May, NJ where we had lunch and walked around and sampled some of their fudge. 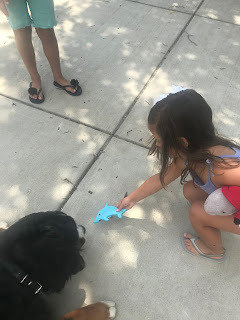 Bonus was we got to see schools of dolphins on our way over to Cape May (and we saw even more at the beach in Rehobeth too - Austen jumped out of the water at first because he thought they were sharks!). Thursday and Friday we hit the beach again and we worked in 2 rounds of mini golf, one night of go karting (Hailey driving was hilarious), multiple arcade sessions, lots of carnival rides and games and of course ice cream every single night with jimmies. Another summer vacation in the books and probably one of our last as next summer we'll only be vacationing at our beach house in Michigan! Austen loved the go karts. I did not. Too many crashes for my liking! Ice cream, ice cream and more ice cream! 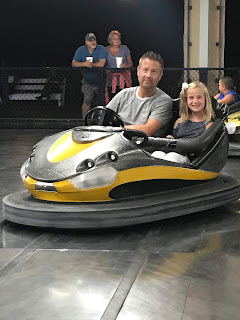 Bumper cars were a hit with all! Hailey made us drive 30 minutes to this dinosaur mini golf place. She loves her dinosaurs! I had to take a picture at each hole with a different dinosaur. This is just one of many!